The main aim of the chemical synthesis is to achieve the efficient making of products from the reactants in cost effective manner. So the reactions are carried under mild temperature and pressure conditions. 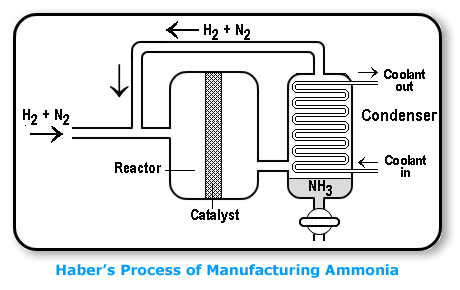 For example, ammonia is produced all over the world at a large scale to meet the demand of fertilizers. The maximum yield of ammonia is obtained at low temperature. But it takes long time to establish the equilibrium. Therefore, the reaction conditions are adjusted in a way to save time and make it economic. Addition of catalyst does not affect the equilibrium. It helps to attain the equilibrium quickly. But equilibrium is never attained under ordinary conditions as hydrogen and oxygen do not combine to form water under ordinary condition. But in presence of platinised asbestos the reaction attains the equilibrium very quickly. Furthermore, the value of the equilibrium constant (1.2´1040) remains same irrespective of the increased speed of the reaction. Addition of catalyst increases the speed of reaction of forward and backward reaction to the equal extent. (a) If the reaction takes place at constant volume, addition of inert gas does not affect the equilibrium as molar concentration of the gases will remain the same. (b) If the reaction takes place at constant pressure, addition of inert gas will increase the total volume. As a result the molar concentration of the gases will decrease. As the numerator has two concentration terms and the denominator has only one term, the value of Kc should decrease. But as Kc is constant at constant temperature, the dissociation of the PCl5 will increase on addition of inert gas. If a system in equilibrium is subjected to a change of concentration, temperature or pressure, the equilibrium shifts in a direction that tends to reduce the effect of change. 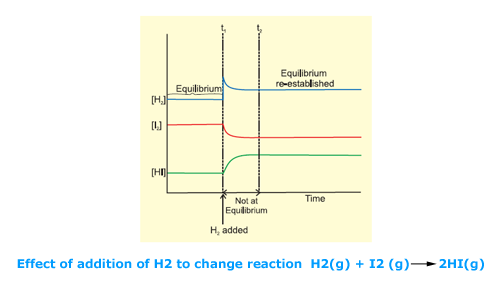 The increase in concentration of the reactants shifts the equilibrium in the forward direction. If the concentration of products is increased, the reaction shifts in the backward direction. 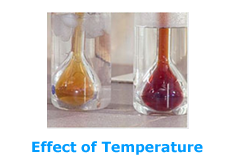 (ii) Exothermic reactions are favoured by low temperature whereas endothermic reactions are favoured by high temperature. How does temperature effect the equlibria? Try to answer. Still need help? Want to know more about it? Click here to schedule live help from a certified tutor!